The older I get the more I appreciate antique furniture. Every piece has a story, you know what I mean? This table was passed down to me from my grandparents. Of course it didn’t look like this when I got it. After I decided to give it a paint makeover, I couldn’t be happier. 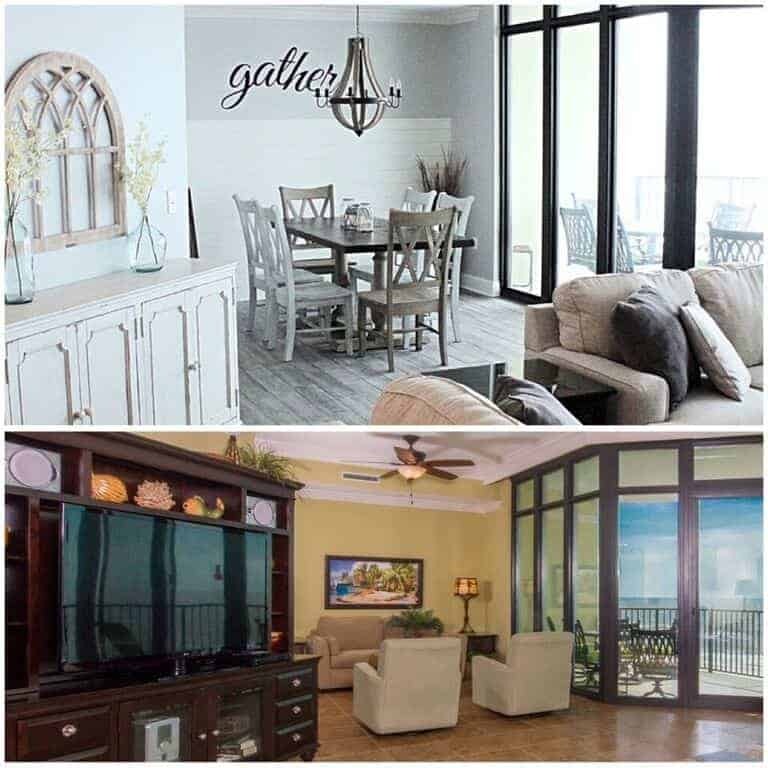 All it took was a little chalk paint dining room table makeover.I can remember visiting my grandparents in Richmond VA as a small child and sitting around the dining room table in their kitchen watching my grandparents cook dinner. It’s crazy to think that the table I’m feeding my children on is the table my mother and her sister used as kids too! That’s one thing I love about older antique furniture. 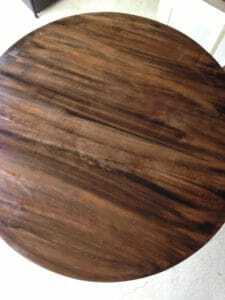 If you find a good dining room table that is made from real wood, it can possibly last you many many generations. This brings me to my dilemma with this kitchen set; it’s a perfect piece of solid oak, with so much history. It just doesn’t match my style. 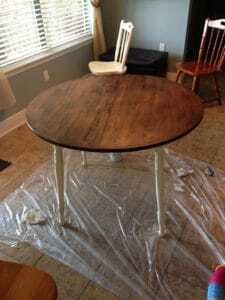 Time to break out the chalk paint and give this vintage dining room table a good makeover. I love a good DIY table up cycle. This was a beautiful kitchen set in its heyday but today, it screams “Country Kitchen!” Yuck, not my modern farmhouse style. Disclosure: this post contains affiliate links. This means that if you purchase from one of these links I will receive a small commission, but rest assured you won’t pay anymore for the product. Thank you for supporting my blog! 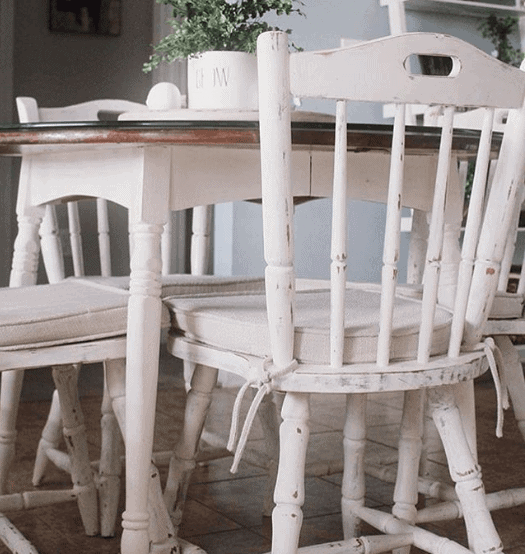 I love furniture painted in an antique white, specifically ANNIE SLOAN CHALK PAINT Old White. I wanted to keep the top of the table looking like wood because I wanted the contrast between the white and dark wood color. 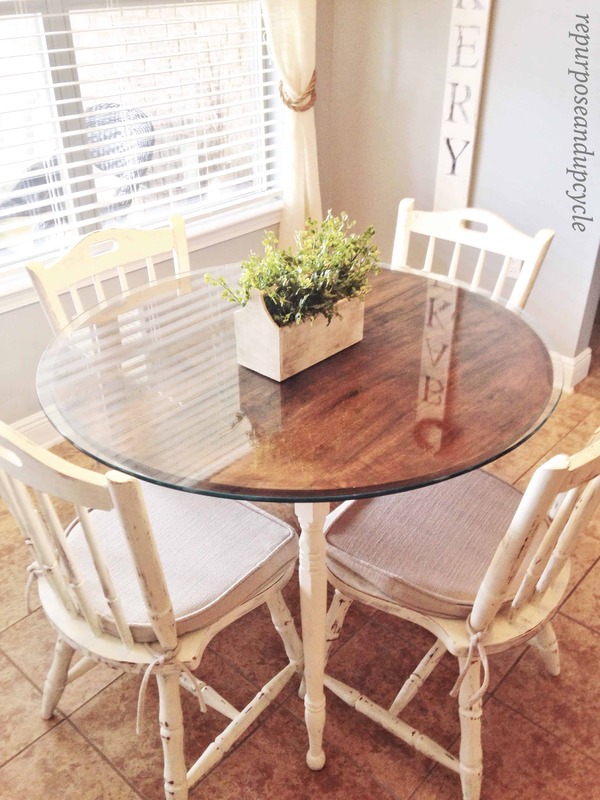 I knew this easy DIY dining room table makeover would transform this piece! I started by chalk painting the chairs. 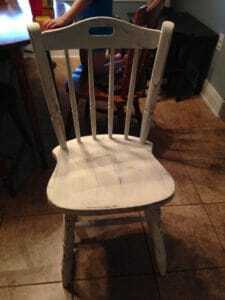 I painted two layers of old white on the chairs and then I took a fine grit sandpaper to “distress” the wood. I finished it up with Annie Sloan clear wax. 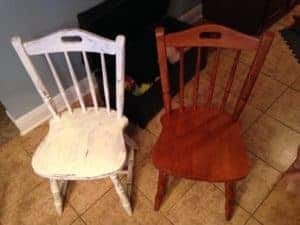 After I finished chalk painting and waxing the chairs, I had to remove the polyurethane finish on the top of the table so I could stain it. Wow, this was a labor of love. I think over the past 60 years my grandfather probably put 20 layers of polyurethane on this bad boy–seriously. I used a spray can of paint stripper by the brand “Skean Strip.” I like the spray can because I didn’t have to “ruin” a brush or a cloth to apply it. because I did not want any hint of red in the table. The color is a great blend of dark wood. Finally, all I needed was to paint the legs white. Do you like the look of my two toned DIY dining room table? I'm super pleased with the way this furniture project turned out. I put a piece of glass on the top (my kids are not forgiving to furniture) and ordered 4 seat cushions from Ballard Designs. I Hope we will have many years of happy meals at this table. It's so cool to think that its been used since the 1950's! Oh how the conversations and meals have probably changed. Thanks for stopping by to check out my chalk painted dining room table makeover. I hope you've been inspired to repurpose an old heirloom or up cycle a piece of furniture yourself! Did you like this post? You might enjoy this vintage dining room table in our new rustic beach cottage! Hello…could you please tell me how you finished the table top after you stripped the old poly off of it? 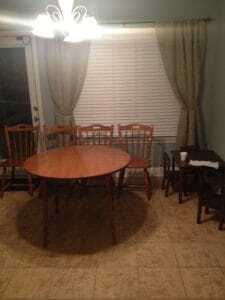 I am getting ready to do my dining room set. My table top has some water damage. I plan to sand, repair, and stain the top. I love the way your table top turned out!! After I stripped the poly off and sanded lightly I used the dark stain and applied it. I applied the stain in the direction of the wood grain. After it dried, I added a glass top and that’s all I did!